Are you looking for an easy healthy soup recipe to warm you up during those cold winter days? 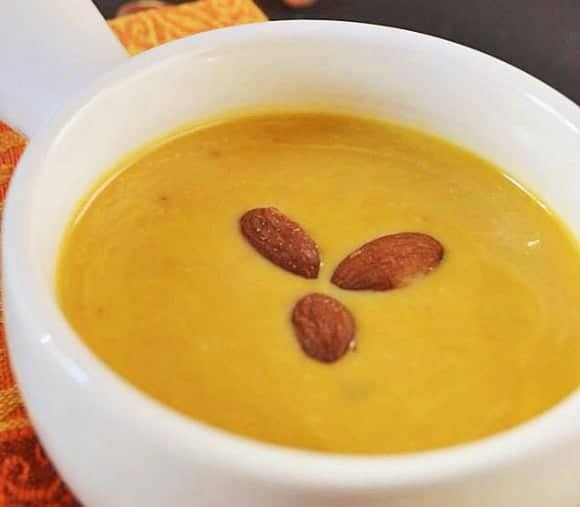 How about making this delicious roasted almond pumpkin soup. With Halloween over, I had lots of pumpkins laying around. Instead of throwing them out, I thought I would make a big batch of pumpkin soup. I used to make this roasted pumpkin soup but I wanted to add a spin on this soup recipe. I roasted almonds and added them to the soup. It turned out so good. If you don’t have a fresh pumpkin, you can use canned ones. Wash the pumpkin and dry it with a towel. Cut it in half and remove the seeds. 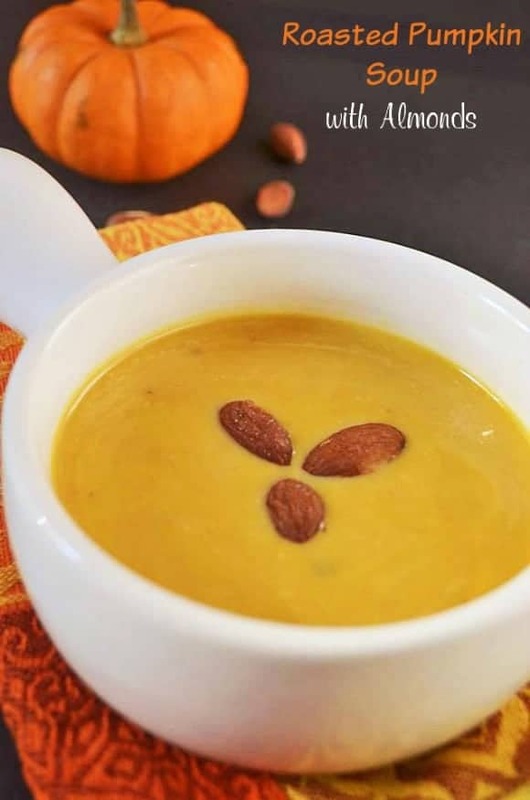 This roasted pumpkin healthy soup recipe with almonds is very filling. I had it for supper and could not eat anything else with it. The kids loved it. They even asked for more (which is very rare). You can freeze the pumpkin in freezer friendly containers. Make sure not to add the milk or coconut milk. You can top it with some shredded cheese. It is also a great looking healthy soup recipe. It is perfect for Christmas dinner or a Christmas party. The colors are just gorgeous. You can serve it with some garlic bread on the side. What is your favorite easy healthy soup recipe for chilly nights? That sounds delicious! This is exactly the kind of dish I love to serve when fall and winter come to Rhode Island. Yum! I have never tried making a pumpkin soup before but your recipe sounds delicious so I will have to try it this fall. It’s a great way to not let the pumpkins go to waste after Halloween has come and went. I have always wanted to try making pumpkin soup. This looks amazing. This is so ironic! Just this morning I was thinking, “I think I’d like to try some pumpkin soup.” Random, though, right? I guess it was just meant to be. I can’t wait to try the pumpkin matched with almond and curry. Mmm! Thanks! This sounds like the perfect dish for autumn and winter. It’s so hearty, and it just has that flavor that’s so great in the cool and cold months. This looks amazing! I love pumpkin soup, but to put almonds on top? Yum!! Pinned. This looks so good! Absolutely yummy! I love pumpkin. This would be a great addition for the holidays. I have never has pumpkin soup, but it looks very inviting! My daughter would like it as well. Although I love the warmth of the summertime, fall has my absolute favorite flavors. This sounds incredible! I can’t wait to try it. this recipe sounds yummy, can’t wait to try it!